Prof. K. NAM’s Media Coverage by KBS. Prof. K. NAM's Lecturing Tour in U.S.A.
Prof. K. NAM's Lecturing Tour in U.K.
To "designize", through research, is to bring design values and benefits to other convergent areas within and beyond design and make that convergence happen. Our lab strives for the strategic utilization of design, possibly beyond the traditional boundaries of design management. We deal with any strategy issues, strategic design issues or broader design management issues: looking at design from a broader organizational, management and strategic perspective, rather than solving design problems at micro-level. Traditionally, design management is defined as "managing design". However, design has evolved from product design to experiences & services to design thinking and design methods. Through this evolution, the transformation of business, technology and society can be accomplished. Design is now treated as a driver for management. Our lab has moved along with this evolution of design management and we extrapolate this and go one step further. We substitue management for something else. 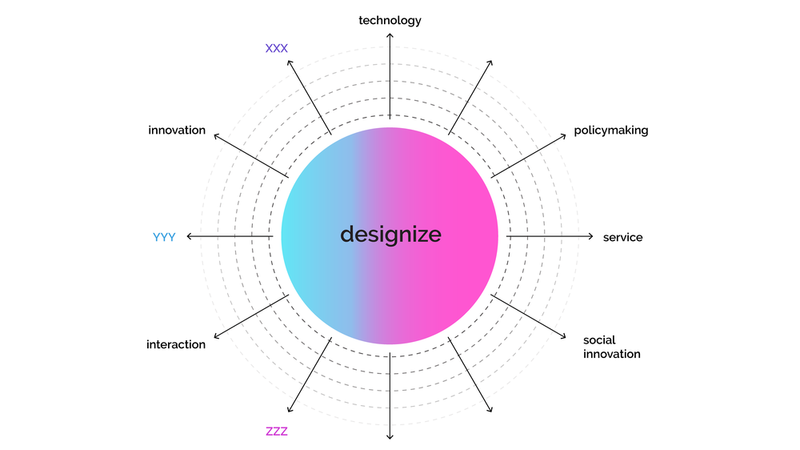 Our lab continuously pushes the boundaries of design management research with research themes, notably with technological aspects, such as policy design and social innovation, social value transformation, civic engagement through digital journalism, interactive advertising and future envisioning for technology with undefined utility. Design can be a powerful driver for any area that has fundamental and direct relationships with human needs and an immediate interface with the end-user. Any area that requires effective solutions for people that can be generated through understanding the human needs and a creative design process with a participatory approach can be greatly benefited from design.